A Big Hug From Daddy God For YOU! 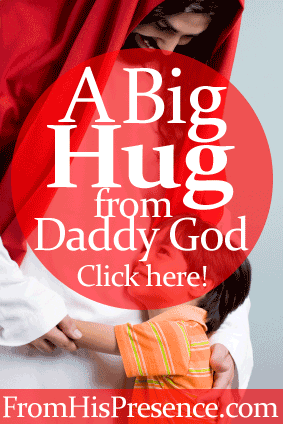 Do you need a big hug from your Daddy God today? Maybe you’re sad. Maybe you’re lonely. Maybe you’re discouraged or depressed or struggling with rejection. Whatever the reason, you need a big, fat HUG. You can have one. Yes, you, right now. How? Because if you have made Jesus Christ the Boss of your life, your Abba Father lives inside you. It’s not just the Holy Spirit inside you. It’s actually Jesus AND the Holy Spirit AND the Father. Yes, it’s true. I’ve heard people say that the Holy Spirit lives inside you, but Jesus and the Father do not. Fortunately for us, however, that is not Biblical. 🙂 How do I know? And the glory which You gave Me I have given them, that they may be one just as We are one: I in them, and You in Me; that they may be made perfect in one, and that the world may know that You have sent Me, and have loved them as You have loved Me” (John 17:20-23, emphasis mine). Jesus said He is in us, and the Father is in Him. That means if He is in us, the Father lives in us too. Well! That puts a whole new perspective on things, doesn’t it? It’s not like our Father is simply seated on the throne in Heaven and is nowhere else. It’s not like Jesus is standing before the Father in Heaven and is nowhere else. No, they are both right here. Your Abba Father, your Daddy God, your loving Papa, is in you right now. He adores you. And no matter how badly you are hurting, He wants to make it better. Close your eyes (after you finish reading this blog post). Imagine your Daddy God right there with you. And He will hug you. He really will. I preach a message about the love languages of God, and every time I have preached it, I have had people do this and He shows out in a big way and hugs His kids. There are tears. It’s amazing how He answers this cry for a big, fat hug. He’s your Father, you see. He loves you with an everlasting love. And He lives inside you. There’s zero distance between you. He is right there with you, and He loves to hug His kids. So go ahead. Ask Him for your hug. Just one of His hugs will comfort you, and you don’t have to stop at one. Let Him hug you and comfort you all day. Did you just ask your Daddy God, your Abba Father, to hug you today? If so, please leave a comment below and tell me what happened when you did! Related: I wrote a song about Daddy’s hugs awhile back. It’s part of our first worship album, and that song is a free download on Soundcloud. Check it out here or using the player below and download it if it blesses you! It’s free! comforting word this morning. The valley of suffering and disappointment can be a lonely place. Great to know that we are never really alone…Father in the Son, the Son in me! I am comforted today. Thank you. I thank the Lord for your testimonials they have encouraged me so much and they are sobering. I love Papa and desire Him not just for me but for my entire family to experience His Love, religion has done a dismantling of truth in Him, even A.W. Tozer mentions that in his books how we have picked up a “program” in place of true worship. I choose to worship Him in thoughts and words from my heart today and pray as He hugs me my husband feels it and my kids and sister. My mom moved back home (heaven) and we miss her tremendously, but the comfort in that is she is with the Father as He is also with me. My human side still wants to kiss her and tell her all that is facing me, but only for God to give her theanswer to give me 🙂 well I shall ask Him directly and choose the intimacy with Him, I dont know you but I love you Jamie for the Lord making you a voice in my wilderness. God bless you in Jesus name Amen. Wow, thank you, Djenne. Your words really meant a lot to me. I’m sorry you’re going through a hard time right now. I pray Papa God would comfort you in abundance and restore joy and hope back into your heart! Thank you for reading and sharing! Again, I sincerely apologize for the long time it took me to respond to your thoughts. Your comment really hit my heart and I wanted to respond properly. I am sorry it took me this time to do so. First, let me say that I am terribly sorry for your storm and this illness that has plagued you. I can’t imagine, but I do know about those lower-than-low moments. I am sorry you’ve felt that way. I have felt very alone, as you described, many times. It’s a painful feeling. I felt it a lot until I started listening to Bill Johnson (from Bethel Church in Redding, California) preach about how God is with us all the time, and all He is and everything He has is with us all the time. I think so often, in religious circles, we get conditioned to ask God to come. That’s what I always used to do. But when I heard Pastor Bill’s perspective, it changed something in me. His sermons taught me not to ask God for an open Heaven, because Jesus already opened it; but rather to thank Him for the open Heaven that Jesus already made for me. And not to ask the Holy Spirit to come, but to just thank Him for already being there. This really changed a lot for me. I grew up with an orphan’s heart and struggled with an orphan spirit into my 30s, so I always felt alone and unloved. But when I started thanking God for already being there, then all of a sudden I could feel Him more. It was almost like saying “thank You” to Him circumvented my mind and my feelings, and tapped my heart and spirit directly into what He had already provided for me. It really made a difference. Holy Spirit, Thou art welcome in this place. It was such a simple song. It’s been around awhile. But it was so anointed and it made me cry and feel His presence, maybe more than I ever had. I wondered later why it touched me like that. But looking back, I think it had such an impact because it doesn’t beg the Holy Spirit to show up. It just acknowledges that He’s already here, and that we love Him, and that He’s our Father. I wonder if it would help you sense His presence, and His hugs, to do the same? To thank Him, and welcome Him, even if you don’t feel Him at first. I know you have faith that He’s there. But you’ve been through a lot, and maybe that would help your heart and spirit circumvent the stress and pain, and tap directly into what Jesus has provided for us, like it did me. 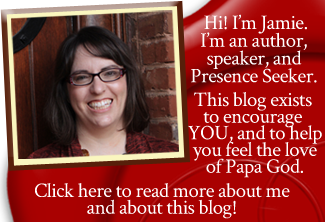 I appreciate your reading my blog, and for sharing your heart. Thank you, and I’d love to hear from you anytime. Did you really delete my comment? Wow. I’ve enjoyed reading your blog. I don’t think I’ll be doing it anymore, though. That you would delete a heartfelt comment from a person who’s struggling immensely with this issue is…shocking. Why did you do that? If you felt it was inappropriate, could you not have emailed me personally to tell me? I’m glad I’m a strong believer, because if I was struggling with that, your actions could very well make me doubt God…please think about that, because I wonder who else is desperately reaching out, and getting their comment deleted, and will turn away from God because of it. 🙁 Thankfully, I know God is good, regardless of how your actions made me feel. I’m just very disappointed, since I’ve loved reading & sharing your blog, and I thought you were a different kind of believer. I’m truly sorry for whatever I did to offend you, and I wish you the best in all you do. Dear Nettie, no, I did not delete your comment. It does take me some time to moderate and reply to them though, because I work 70 hours a week and can only moderate and respond to comments usually on weekends or at night. I am sorry that this delay hurt your feelings. I wanted to give your comment thorough feedback, as your plight moved my heart. I always do my best to moderate comments as quickly as I can, but sometimes it takes time and this week has been particularly hard, with late-night meetings most nights of the week. As a full-time corporate professional, plus a wife, plus a shepherd, unfortunately sometimes I can’t get to things as quickly as I would like to. Again, I humbly apologize for the delay and I do ask you to forgive me. Wow, yes, I can see you’re definitely busy and how it takes some time- longer than I realized- to moderate. There is nothing to forgive. I do hope you’ll forgive me for overreacting; I thought maybe you deleted it because most of what I wrote seemed like I was trying to negate the positive post you’d written. I’m sorry for jumping the gun. I’ve read enough blogs to see this happen to other people and here I went doing the same thing. I read your other reply, too, and it resonates with me. I’ve been struggling with this so deeply. Before I got sick, I spent a few years turning my back on God and choosing a prodigal lifestyle. After getting sick, and re-realizing my desperate need for God, I repented, and in many ways I’m following Him more deeply than ever. But I still struggle with guilt for turning my back on Him, no matter how many times I’ve asked for and received His forgiveness. Then I get caught up in condemnation. I’ve struggled with this for 3 years, all while praying for healing, and I think my self-condemnation and guilt are blocking HIs healing from flowing. Then comes the feeling of Him not loving me, and the desperation for His presence, yet nothing happening. I really can’t even express how dark this time has been and how desperate I am for Him to invade my circumstances and heal me. I’m going to give this practice a try- thanking Him for his presence and His love, believing He’s right beside me. I’ve been doing it wrong for so long, I think. Thanks for your reply & your thoughts on this. I’m so sorry you’ve been through this. It sounds like you’ve got some good ideas about where the enemy might be getting his talons into things. But God is so much greater and so awesome and amazing and loving and good, and His Word heals us every time. I’ve been listening to a lot of sermons and reading books (in addition to the Bible) over the last few years that have really helped heal my heart, and have helped me sense His love and affection. If you have spare time on your hands and want any good reading material, or YouTube videos to watch etc, please feel free to let me know. I’d be happy to suggest some of the things that have been so healing to me. Blessings to you, and happy New Year! Hi Jamie, I asked daddy God for a hug just now and I started getting really emotional. I burst into tears and told him how much I loved him and that I know how much he loves me too. That when I go to heaven I want to dance with my daddy God, talk to him, play games with him and spend time with him and that he is the best Father I’ve ever had. It was amazing! Daddy God never refuses to hug His kids, Joe. He’s a good, good Father who loves you very much. If you will come to Him expecting, and receiving His love, you will sense it. But if you come to Him skeptical, or angry, not believing that He loves you and wants to demonstrate that love, you cut off the pipeline of relationship, which is spelled f-a-i-t-h. I really need a hug from heaven. Just over two years ago I started having panic attacks that left me unable to work and unable to go out. Things started to improve and I was able to get out and the symptoms etc started to fade a little. However last few months things have flared up depression raised its ugly head and suicidal thoughts surfaced. I feel really alone. May the Lord bless your heart joe and let me assure you that he is with you and he sees you,he sees your suffering.You know i just recently read a scripture about how when Jesus comes back we’ll be made just like him in a twinkling of an eye, how there’ll be no more pain or crying ,he said he’ll wipe away our every tear and he also said,To all who are thirsty I will give freely from the springs of the water of life.rev 21:6 but most importantly how we’ll see his face and be where he is.You see Joe your struggle is only temporary, your struggle is a set up for something so much greater,my pastor once said life is short but eternity is forever and be glad Joe for you get to spend eternity with him,in his arms ,in his presence free from all life’s struggles forever.God said he’ll prepare a feast for us with his own hands Joe.I want you to know that as i’m writing this message there’s a lot of love for you in my heart and i know that it’s from Jesus, you see Joe you are not alone, you are love and divinely favoured, i’ll make sure that i’ll pray for you and your wife for a breakthrough but i know that Jesus has got you and i wish to hug you right now,just know that you’ve got brothers and sisters in Christ who love you and are praying for you.And the best thing to do at this time is to look to Jesus ,who he is ,his love for you and his power rather than your situation ,look to him for strength for he says when we are weak then we are strong for his strength is perfected in weakness. The psalmist says God is the strength of ourlives ,he is our portion,our fortress and our shield from danger, a very present help in times of trouble. The lord himself says that he is our shield and our exceeding great reward in genesis.He never abandons anyone who comes to him and he says call unto me and i will teach you great and unsearchable things that you do not know.Meditate on the Lord’s word, the lors loves you so much and cares for you cast all your anxiety upon him.I love you and your wife Joe and i hope this email finds you well.I’ll be praying that you never lose sight of who Jesus is nor lose your faith during this time.It’s gonna be okay Joe you’ll see just look to him,he loves you and he sees you. Daddy huged me today. This article made me look at things through a different lens. I never thought of God living in the inside of me. This is great to know. I am so grateful for your site. He sure does. It’s an amazing thought. It blows me away to think of it too. So glad Papa blessed you today! thank you Jamie, this Word came at a right time for me, God is ministering to me through this message, its indeed His RHEMA WORD for me…. there is nothing l can ask for right now other than this Huge hug from my Papa God..
thank you and stay forever blessed. Absolutely LOVE this! Thank you for sharing your gift! Thank you Abba, my Daddy, and Papa for your word through Jamie! This is true! I heard somewhere that the original hebrew really translates to Jesus and the Father promising to come and set up their furniture in us. Like a real home! So we really do have all Three Divine Persons of the Trinity residing in us- AMEN!!! !